After a little drama we ended up tied for 1st place with 253 stars. We had way higher destruction percentage though so we are now moving up to Masters 2. Also, it seems my promotion of Agent was a bit premature. I logged on just long enough today to see Mirek and Tribal throwing heavy hands at each other and Agent throwing the ban hammer around for reasons unknown. Yeah... he kicked morrow for absolutely no reason other than he 'felt triggered '. Mirek hit new standards of comical low this war. @TUF, do you write the fb posts for Ford? Cos if so, the picture of the big unit next to a massive SUV with the caption "
Thank you to Noah for visiting us today and congratulations on his new Silverado. Glad it was such a great fit for you. Thanks again." Thoughts on e drags or miners for this base. I cooked an e drag army but am having some ragrets. The 2 multi infernos, grounded xbows, and 2 closely grouped ADs I can freeze with one freeze spell sold me on air but open to suggestions. Personally I like Edrags vs multi infernos more than single infernos and with 2 grounded xbows that is what I would use. Yea if they were all single infernos I would leave the drags at home. Second guessing myself now though after staring at it too long. May just bowler smash it from 1 oclock. also... I'd love a war where neither Dave nor mirek hit a 1 star or less raid. It's just a waste of an attack. They may as well hit th11s. Yea, those big boy ADs still scare me a big. It's the only thing maxed on that base I'll probably just Mirek spam some bowlers in. Dave gets unfairly grouped with Mirek imo opinion but Mirek's problem is he smashes one base and thinks the next attack is going to be the same and doesn't plan anything and just spams bowlers to glorious 45% 1 star. Maybe. I feel that Dave gets about the same frequency of 0/1 star hits though. Lol, you're spot on with mirek. Did an fc for him today. Did his wigibo spam attack and got a 90% 2 star. Told him that attack was a 1 star attack waiting to happen. Fc another base...75% 1 star. Both him and Dave just use one attack every single time. It's definitely a limitation. lol, how the fook does mirek not know sparta? lol bringing back some fond memories. tbf, Sassy has invited so many randies, I don't know if I'm in global half the time so maybe mirek just lost track. Lol. I was as surprised as the next man! Which just happened to be winterfell. Lol. I have a horrible feeling that this recruiting frenzy is so we can do 30 v 30 and 15 v 15 in the feeder. So many lost medals if we do 30. Yeah. The only positive thing is it satisfies sassy's curious sense of obligation towards making randoms feel included. I'm fairly confident I can talk her out of it. Taking the Dave approach to war for a while. Feeling like a liability when I can't even 3 star a glorified TH10 from this chitty wok phone. Buttons don't highlight enough that it's going to cuck my attack everytime. Will hopefully be back for CWL. Skins unlocked by progression based tiers. We Fortnite now boys!! Supercell only makes $350+ million annually though. They need more capital mate. Who's gonna volunteer two fiddy for me to get these pay to win perks. Could care less about the skins tbh but if you're not a maxxed TH12, the hero book alone usually cost $5 in gems anyways. 6 potions, 4 runes, 50 gems from the shovel, 10 million in saved loot from the wall rings, book of heroes, reduced and boost times. $upercell are cucks but it's not a bad deal tbf. True but tbf, a lot of their stuff is already behind a paywall and this is a lot better deal then their current paywall so I welcome it. I'll be a max TH12 in a few months so this doesn't benefit me nearly as much as some of the lower THs but pretty decent value at $5 one time. Watching the Championship live. So many hipster attacks. A lot of these pros use a shocking number of pekkas on attack, archers in defensive CCs, and multi set infernos. Some chitty wok base designs as well. Just watched a max 12 with grounded xbows/all multi set infernos and people seemed to be surprised he got tripled by mass e dragons. CWL is nearly upon us again. I already have a growing feeling of dread! It's slightly awkward... her main base is now clearly the weak link in cwl. We've got two th12s and a th11 in the feeder... and then a th10 in the main. 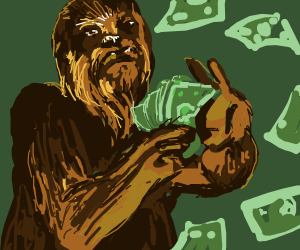 Needs to start splashing that chewie cash! Her repeating the trope that any TH12 should be able to 3 star any TH11 right after Cox's shortcoming on a TH11 was especially comical considering she's neither been a TH12 or attacked TH11s. Lol, occasionally she 3 stars one of those TH11s with like one L1 canon and a couple of teslas and doesn't seem to realise it's not a genuine TH11. She does have a point though; Dave should be able to 3 star any TH11 with his eyes closed. I'm beginning to think he queen walks straight into single infernos just to wind me up. meh. I can't speak for somebody that has maxxed heroes but everybody in the clan has come up short against 11s. Have even seen Mirek hit the elusive 0 star on a TH11. That takes planning. Being a new TH12 is particularly undesirable because it comes with all the TH12 expectations but chitty heroes and troops. Bowlers were my 3rd choice for an army on #11 but it's my only max troop at the moment. I think some jimmies are going to be rustled this CWL. Oh, I don't think new th12s with middling heroes should 3 star every th11. But max heroes are absolute beasts. Add to that the greater experience of dealing with exploding town halls plus having all maxed troops and the like and there's a huge margin for error when you hit a th11 with a max 12. It should be a 9/10 thing. I reckon Dave/ mirek only get 3 stars about half the time. My sensitive socialist Scandanavian soul is offended. Got anymore of them maintenance breaks. @juice64011 How are you and your clan enjoying the new update? My clan is spending zero dollars on the first update but I'm happy to be rewarded for completing challenges. I approve of your clan's prudent approach. Bunch of wannabe high rollers over here.